Col. Robinson's house on Robinson Rd. as it appeared in 1902. Unfortunately, the house was razed by fire in 1937. A stone marker remains near the original location of the house. Each Massachusetts town has its Revolutionary War heroes. Some served from the first day of the conflict, while others, due to either distance or age would serve later. A relative few can be found in the many history books that have been written since, and in most cases the same small group is found throughout the narrative of those early days of our nation. It is the responsibility of each community, to remember and keep their stories from being forgotten. One individual who is well documented to have played a significant role during the war, and yet has eluded most accounts, is Col. John Robinson (1735-1805). In late 1774 he was appointed Lt. Col. in the Northern Middlesex regiment of minutemen commanded by Col. William Prescott of Pepperell. Being of significant rank, he was one of the first in Westford to be alerted by an alarm rider of the march of the Regulars to Concord on the 19th of April, 1775. He and a handful of other Westford men arrived early at the North Bridge. Major Buttrick offered command of the march toward the Bridge to Robinson, his superior officer. He declined, citing that most of his Northern Middlesex men had not yet arrived, but instead volunteered to serve at his side at the head of the column. It is said that the shot which injured Acton's Luther Blanchard passed under Robinson's arm. Though we rarely hear of Robinson's involvement that morning it was obvious at the time. A quick inspection of the only contemporary visual account of the action at the North Bridge, the famous Ralph Earl print, confirms this. Based on interviews by Connecticut militiaman Amos Doolittle within a month of the event, the print’s caption reads, "The Provincials headed by Colonel Robinson & Major Buttrick at the Bridge." Following the events at Concord, he continued to serve in the siege army around Boston. Continuing in Prescott’s regiment, he served as second in command at the Battle of Bunker Hill, one of the bloodiest engagements of the Revolutionary War. In a letter to John Adams written two months after the battle, Prescott wrote of Robinson that he “behaved with prudence and Courage” as he led a detachment to flank the enemy. In early 1776 Robinson was appointed colonel of a regiment of over 400 men in Cambridge in support of the Continental Army under Gen. George Washington. And later in 1777, Robinson commanded another militia regiment, keeping watch over British occupied Newport, Rhode Island. An unintended consequence of the war during the summer of 1775 was the spread of diseases from the Army’s camps around Boston and a significant increase in civilian deaths in Westford and other surrounding towns. Among these were three of John and Huldah Robinson’s young daughters, lost within two weeks. Robinson distinguished himself throughout his life. In 1760 he served for over eight months as an officer during the French and Indian War. His service to the town of Westford included several years as selectman (1771-73), and as a member of many town committees. Following the war, in what became known as Shays’s Rebellion (1786-87), economic injustices drove many to protest by shutting down government institutions such as the courts. Robinson supported one of his former captains, Groton’s Job Shattuck, in the closing of the courts in Concord in September of 1786. Years later, in 1824, the Rev. Joseph Thaxter, one of the first army chaplains of the war and a witness of the events at the North Bridge, said of Robinson, “a braver and more upright man I never knew.” Further, he proclaimed that “Such men … ought not to be forgotten by those who write the history of the commencement and prosecution of our glorious revolution. New information has come to light regarding a militia regiment that was commanded by Col. Robinson during the siege of Boston. The existence of this regiment is not noted in past biographies describing Robinson's military career, and so is not widely known. In February, 2003, it was confirmed that a previously unrecognized orderly book belonging to "Robinson's Regiment, Camp at Cambridge" was that of Col. John Robinson. This discovery provided the initial direction for this new research. John Buttrick of Concord, who led the provincials at the North Bridge with Isaac Davis and John Robinson, was Robinson's Lt. Col. in this regiment. Rev. Joseph Thaxter served as the regimental chaplain. Westford doctor Asaph Fletcher was commissioned the regimental surgeon. Another notable figure who served in this regiment was Captain Job Shattuck of Groton who would later gain fame as a leader during Shays's Rebellion of 1786-87. In 1777 Robinson formed his own regiment for service in Rhode Island. The regiment served there for 6 months until January 1, 1778. Muster rolls for several of the companies of this regiment can be found in the records of the National Archives. Further details will hopefully find their way to this site. 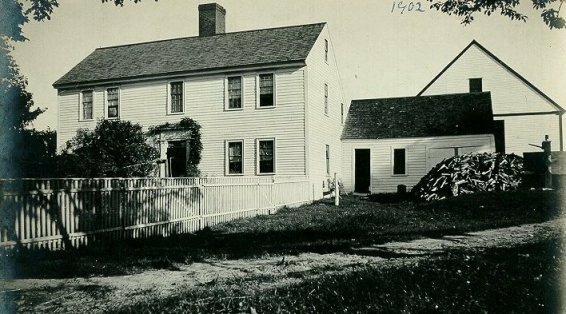 In addition to the upheaval caused by the start of the war, personal tragedy struck the Robinson family during the summer of 1775: Within one two week period, three of the children died. On August 30th Sarah died at the age 3 yrs, 3 months, and Betty at the age of 5 yrs, 3 months. Mehitable died on September 9th at the age of 8 yrs, 28 days. Although the cause is not certain, it is quite likely that they were victims of the diseases that were being brought out into the countryside from the military camps surrounding Boston during the siege of '75-'76. Not uncommon during this period, such examples help to remind us that the human costs of the war were not limited to soldiers in battle, but by indirect means to their families at home as well. 1. Huldah, born September 23, 1765. 2. Mehitable, born August 9, 1767. 3. Betty, born May 3, 1770. 4. Sally, born May 3, 1772. 5. Rebecca, born July 7, 1774. 6. John, born February 17, 1781. "Here reposes the body of Col. John Robinson, who expired June 13th, 1805, aged 70 years. In 1775 he distinguished himself by commanding the corps of soldiers who first opposed the menacing attempts of the British troops at Concord Bridge. Let heralds far proclaim thy soul was fired By love of freedom and by Heaven inspired. First in the glorious cause our rights to attain, Last in our hearts shall thy brave deeds remain." Note that the Robinson family tradition, as expressed in his epitaph, states that Col. Robinson commanded at the North Bridge. A few of John Robinson's belongings from the Revolutionary War period can be seen on display at the Westford Museum . Westford. Lieutenant Colonel, Col. William Prescott's regt. ; entered service April 19,1775; service, 3 mos. 20 days; also, Lieutenant Colonel, Col. Prescott's regt. ; return of officers, dated May 25,1775; ordered in Provincial Congress May 26, 1775, that said officers be commissioned; also, Lieutenant Colonel, Col. Prescott's (10th) regt. ; list of field, and staff officers appearing on a return of Capt. Henry Farwell's (1st) co. [probably Oct., 1775]; also, petition addressed to the Council, dated. Cambridge, Oct. 28, 1775, signed by Col. William Prescott and said Robinson, asking that certain officers belonging to Col. Prescott's regt. who had served as commissioned officers from the formation of the army receive their commissions; ordered in Council Oct. 31, 1775, that said officers be recommended to Gen. Washington for commissions; also, official record of a ballot by the House of Representatives, dated May 7, 1777; said Robinson chosen Colonel of a regiment to be raised for defense of Boston harbor; appointment concurred in by Council May 8, 1777; reported commissioned May 8,1777; also, Colonel; muster roll of field, and staff officers, dated North Kingston, Dec. 18, 1777; commissioned June 27, 1777; term, 6 months, to expire Jan. 1, 1778; also, Colonel, Col. David Mosely's (3d Hampshire Co.) regt. ; entered service June 12, 1782; discharged June 14, 1782; service, 3 days; horse rations allowed said Robinson; reported as not belonging to said regiment although serving with it; regiment raised for support of the government at Northampton. Under --- Robinson: Order of the day, dated May 18, 1775; said Robinson, Lieutenant Colonel, reported officer of the day for "tomorrow"; also, order of the day, dated Cambridge, June 1, 1775; said Robinson, Lieutenant Colonel, reported as field officer of fatigue for "to morrow". Under John Robertson: Order of the day, dated Cambridge, May 18, and May 25, 1775; said Robertson, Lieutenant Colonel, appointed field officer of the day for May 19, and May 26, 1775; also, general order dated June 13, 1775; said Robertson, Lieutenant Colonel, appointed officer of the main guard "to morrow morning"; also, official record of a ballot by the House of Representatives, dated Jan. 23, 1776, for officers to command the six regiments to be raised to serve before Boston until April 1, 1776; said Robertson chosen Colonel of a regiment to be raised in Middlesex and Lincoln counties; appointment concurred in by Council Jan. 23, 1776. Under --- Roberts: Order of the day, dated Cambridge, May 19, 1775; said Roberts, Lieutenant Colonel, reported field officer of the picket guard "to night".